After Sunday’s partially unsuccessful visit to Stanpit and Mudeford, I headed back there today. Unlike Sunday, the Long-tailed Duck was offshore, but as expected was too distant for photos, so the inevitable ‘photo from the internet’ has been posted below. Long-tailed Ducks are unusual in that they have a distinct winter plumage, most male ducks moult into a drab ‘eclipse’ plumage after breeding and moult back into their breeding finery by the onset of winter. Long-tailed Ducks, which are high arctic breeders moult into their brownish breeding plumage for the summer, into an autumn ‘eclipse’ and then into a winter plumage. Different feather tracts may be replaced once, twice or three times in a single year! Arguably the winter plumage, particularly in the adult male, is more attractive than the breeding plumage. 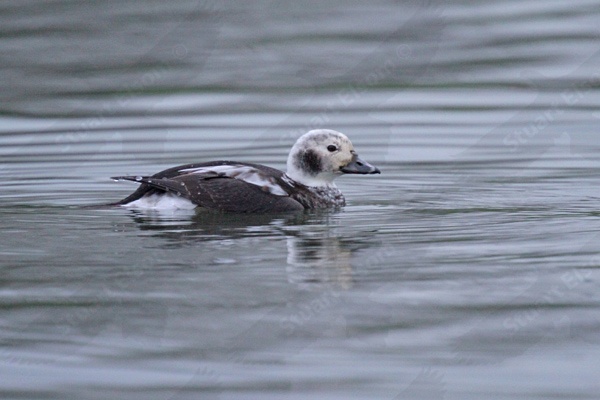 A winter plumaged female type Long-tailed Duck (photo from the internet). A male Long-tailed Duck in breeding plumage photographed in Spitsbergen in 2009. At Fisherman’s Bank the Spotted Sandpiper showed well after a short search. It is a shame that we didn’t get good views on Sunday, as Margaret has never seen one. ..... but this bird is starting to show the best diagnostic feature of all, its spots, are just starting to appear on the rear flanks. In flight the white wing bar does not extend to the inner wing as it does in Common Sandpiper. Another 'spotted' bird was present, a Spotted Redshank. Formerly there was a large passage of this species in the spring, many in their gorgeous white spotted black plumage, but in recent years we have seen it mainly as a scarce winter visitor. Spot Reds often swim in the manner of a giant phalarope, as can be seen here. It is unusual to see Bar and Black-tailed Godwits feeding together, as they prefer different types of mud or sand. Bar-tailed Godwit (two at the front) are smaller, have scalloped backs, slightly up-turned bills and shorter legs (mainly the tibia). Longer legs means that Black-tailed Godwits have to a adopt a more 'bum in the air' posture when feeding. The huge white wing panel of the 'Blackwit' makes them easy to distinguish in flight. ... and Little Egrets are growing the 'aigrettes', filamentous plumes that were once in such demand for the millinery business that the species faced extinction. .... and showed nicely along the footpaths. Finally in view of todays date, Margaret and I are off for a candle lit dinner tonight. « 13th February – Swineham area.